Charles Gibaut Bissell-Thomas was born in Jersey in the Channel Islands on Tuesday 13th March 1956. He was never happy with that name so as a teenager he changed it - first to Charlight Utang, then Soma Love, again by deed poll to Jungleyes Cism Love and finally Jarl Love. Then he opened a shop in Kew called ‘World Tree Mend Us’. Have a night to let your hair down with other parents from your nursery, pre-school or children’s school year - and ask your girlfriends along too. 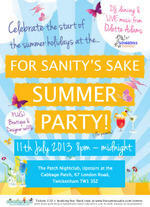 It’s club night at The Patch with For Sanity’s Sake with live music, dancing and DJ. Raising funds for a Memorial on Twickenham Embankment to those who died in 1944 when a doodlebug caused the deaths of 11 people. Over 100,000 west London residents have spoken out against any Heathrow expansion in a local referendum. The new grazing season has started on Petersham Meadows for 2013 but with one obvious difference - the new herd is an entirely new breed of cattle. In the early hours of Friday, 28th May 1943, All Saints Church, standing by the Thames in Old Isleworth, was destroyed by fire. The alarm was given at 2.30am by Miss Burrage who lived next door and again by Mr. McDonald, the publican of the “London Apprentice”. Against the darkness of the wartime black-out the glow of the huge fire could be seen for miles. Vital Voices is about a new way of learning to sing, taking your voice in a new musical direction; it’s not something you may have experienced before, or seen on TV. It’s not Glee, nor a church choir or a community sing-song but a way to give ‘Voice’ to the music inside you, and share it with others in a relaxed setting. We not only sing part-songs but also work on developing range and tone. We learn to improvise and harmonise, playing with and learning how to care for our voices. Our group also uses percussion to enhance our musicality. 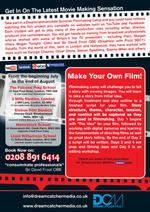 Make a 5 minute film in 5 Days and take a copy home on DVD! Here at Dreamcatcher Media, the films made on our Summer Film Camps feature great heroes and anti-heroes, goodies and baddies, exciting chases and dramatic scenes - all scripted, filmed and directed by young people aged 8 - 16.